Today up in Moscow, Idaho, where I lived for six years and attended college, there’s something slightly revolutionary going on, for Idaho at least, and it’s been going on for 18 years now: the Moscow Hemp Fest. This day of live music, local artisans, food, tie dye, and of course, hemp advocacy and education, happens in the middle of the small city’s main park. 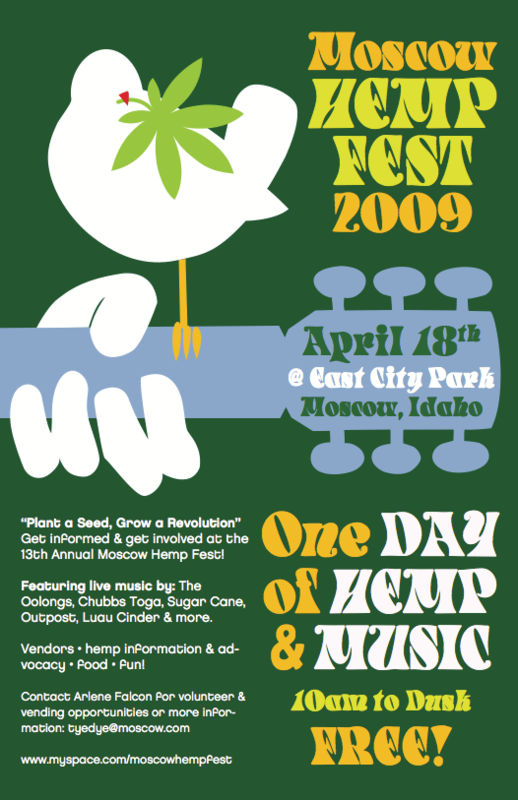 It has been over six years since I left Idaho, but I’ve had the pleasure of keeping some roots there by designing the posters and t-shirts for Hemp Fest each year. 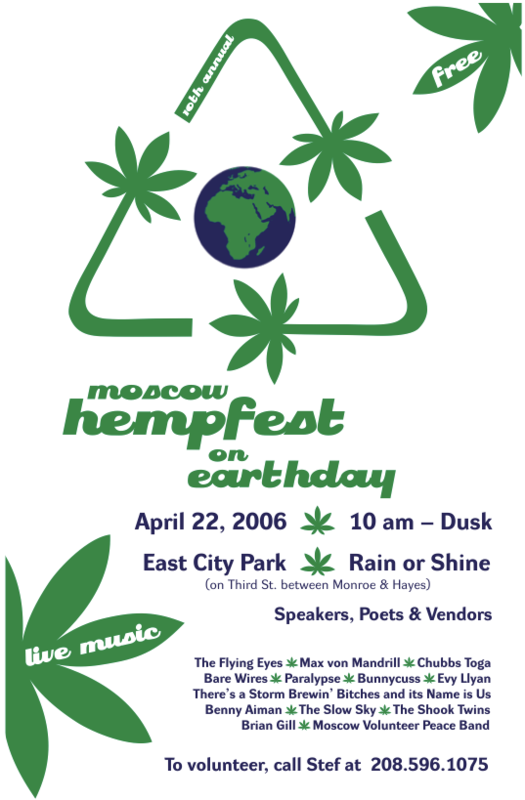 I went to Hemp Fest while at University of Idaho, and first got the opportunity to design the poster and t-shirts in 2006. Almost every year since, I have created posters, flyers, and t-shirt graphics for the event, collaborating with Arlene Falcon, the colorful organizer of Hemp Fest and owner of Tye Dye Everthing. You would think I would get tired of designing with pot leaves year after year, but it’s actually one of the projects I most look forward to each spring. Hemp is a versatile plant with so many various uses and benefits to humankind, so naturally I have endless inspiration for design concepts. 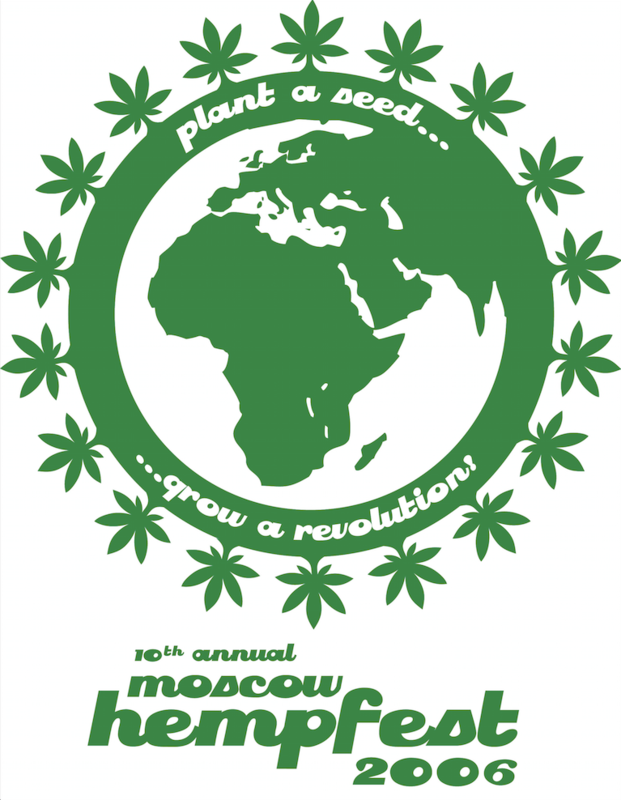 And until it’s legal, Moscow Hemp Fest will keep fighting the good fight in a very red state surrounded by medical and now legal cannabis states (which we made painfully obvious with this year’s poster design). We usually try to think of a theme for each year and over the years there have been some pretty great concepts. My first Hemp Fest poster was in 2006. Hemp Fest was on Earth Day, so my very simple retro design used the recycling symbol, Earth, and of course, lots of leaves! And speaking of retro, one of my favorite designs was created in homage to the Woodstock poster for Hemp Fest 2009, on the 40th year since the festival that started it all. 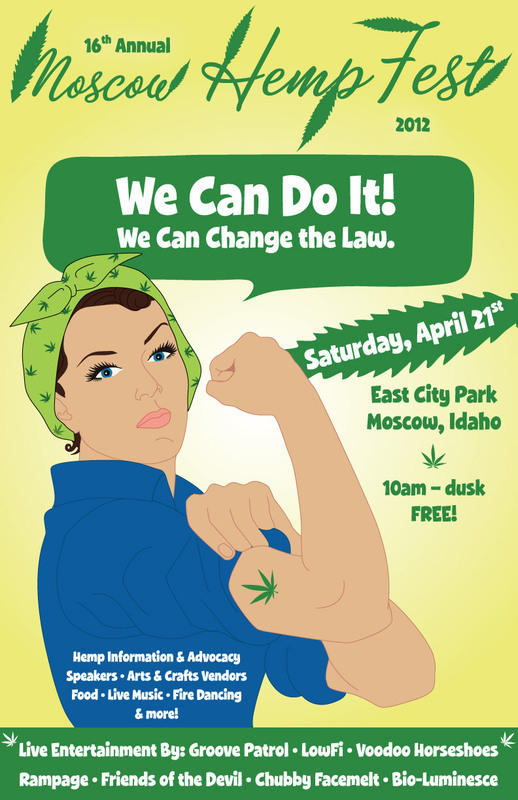 And the poster that I am probably most proud of for Hemp Fest so far was in 2012: our theme was “We Can Do It. We Can Change the Law.” and Rosie the Riveter was our mascot for the poster. 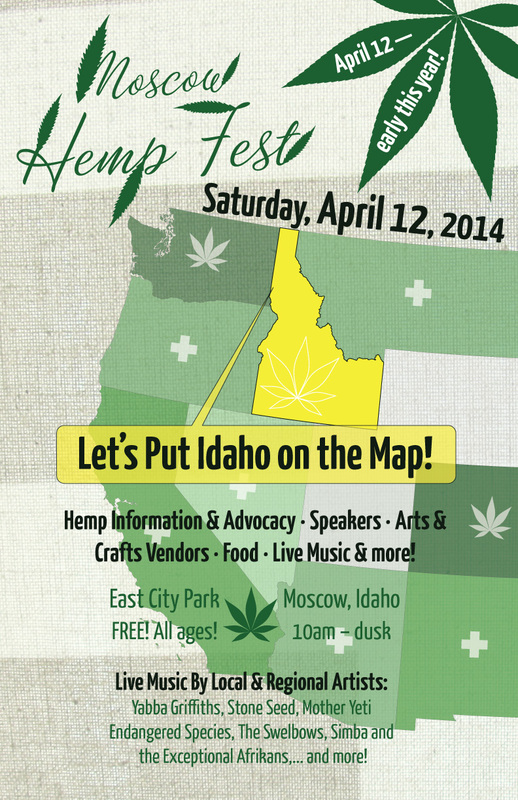 I hope that there was sunshine and a great turnout for Hemp Fest 2014 today. I usually try to go back up there for a visit this time of year but haven’t been to Hemp Fest in a couple years now. It has prevailed through rain, shine, wind, and snow, minimal funding and a very stubborn state government, but thanks to the tireless efforts of a small handful of volunteers, the people of Idaho are learning about cannabis hemp and demanding safe legal access to its benefits. Hemp Fest has succeeded in gathering signatures for voter initiatives and even gaining the support of a Republican Idaho State Representative, Tom Trail, who has written several bills on the issue.